Get ready to make an awarding ceremony elegant. Here at Jinhua Miyue Crafts Co., LTD, you can have the best crystal trophy of your choice. We have a high quality selection of trophies you would like. Our crystal trophy reflects perfection and elegance. Each of the items is perfect for corporate awarding so you can be sure the event would be a more memorable one. Crystal trophies have a fine texture that you like. We boost the design of the trophy to make its texture captivating. Our trophies are attractive a person or awardee would be happy to receive it. You can choose from the design option we give you. We’re open for suggestions if you want to customize the trophy. Our team is always ready to guide the design you like. Miyue Crafts makes it a point to give you the best trophy you need. 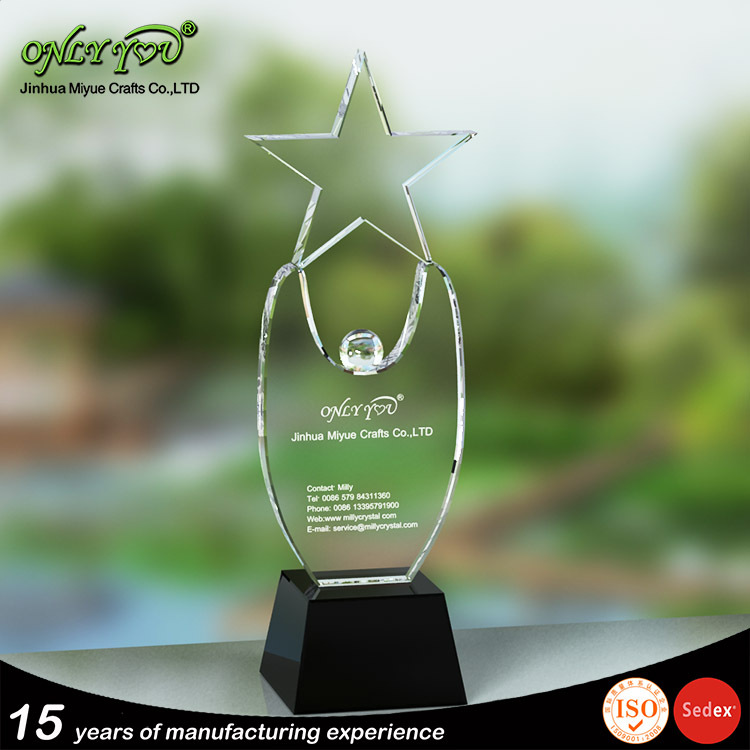 Jinhua Miyue Crafts Co., LTD always sees to it that the crystal trophies are perfect. Yes, you can expect a fast and systematic process in the trophy creation. Each of our trophies has a unique design and a stylish engraving. We can add a logo or a quotation if you want. You take a chance and see the beauty of our creation. Crystal trophies add color and elegance to an event or awarding. If you want to surprise your friend, you can do it by recognizing his or her efforts. The crystal trophy is perfect for the awarding ceremony for your friend. Perfection is always present in each of the trophies we provide. Different awarding or recognition events require diverse trophies. So, it would be best to buy a crystal trophy to provide elegance to the recognition. You can have a unique design of the trophy depending on the occasion or event you would attend. We can make the trophy simple and stylish. We have design options that reflect the theme of any awarding or event. You can add a logo or quote on the trophy. Examples of the possible engravings are the name of the awardee and title of the award. Jinhua Miyue Crafts Co., LTD makes sure that the details or letters are clear. The person or group of people who would receive the award would be happy. You talk to us and select the details you want to include in the trophy. The Jinhua Miyue Crafts Co., LTD makes sure that its trophies are not only elegant. You can be sure that these would last for a longer time. We’re careful in sourcing the materials for the trophy. Customers would be happy to order and add this to an awarding. The team is careful and accurate in making and designing of the trophy. We want the trophy to have an attractive look. You can have satisfaction in having our trophies. Why? Each of the trophies has a reasonable price. We’re also proud to offer you that each trophy has different colors you can choose. It suits the needs of the client as they would find the trophy attractive. Jinhua Miyue Crafts Co., LTD aims to make a difference in any awarding event. So, we also focus on the style and sophistication of the trophy. Our expert designers and the teamwork to provide you with a stylish trophy. They use a stylish approach to make the appearance of the trophy unique. For sure, you would love to have the trophy due to its beauty and elegance. You can talk to us now and order the crystal trophy you like. Jinhua Miyue Crafts Co., LTD shares its vision of excellence to its clients. We show our creativeness and expertise to in each of the trophies we offer. We exert effort and time to make each item superb. We value your trust, so we make sure that product matches your standards. Jinhua Miyue Crafts Co., LTD is here to give you the best selection of crystal trophy. You take a look at our selection, and we give you the best products. Here, you not only have the best trophy choices. You also have an excellent quality of the product. Jinhua Miyue Crafts Co., LTD is open for your suggestions. You can add creative designs, and we add it into creating a crystal trophy. You can add decorative details on the trophy. We can do that for you with ease. Come and talk to us now and make an order. You can be sure that an awarding ceremony would be a success. For sure, you would love our crystal trophies! Why Choose Our Glass Awards ?